WHY no advertising? A personal explanation by the founder and Editor-in-Chief. This magazine is UNIQUE! In many ways. No other is like it. No other gives you UNDERSTANDING of today's NEWS — of where it is leading — of what is prophesied biblically for the near future. No other gives you UNDERSTANDING of the world in which you live — of the incredible PARADOX of modern 20th century awesome PROGRESS, but with appalling evils, seemingly unsolvable TROUBLES, universal discontent and unhappiness with violence, wars, human suffering. No other gives UNDERSTANDING of WHY humanity is here on earth — the real meaning and PURPOSE of human life and what really lies ahead for us. Yes, this magazine is PRICELESS — no subscription price — no newsstand price — you can't buy it! WHY? I had wondered WHY this world is full of discontent, unhappiness and suffering, with unsolvable problems and troubles amid such awesome material advancement. Scientists and educators were saying, "Given sufficient KNOWLEDGE, we will solve all our troubles and eradicate all our evils." Knowledge rapidly increased — but so did troubles and evils. The foundation of the 19th and 20th century escalation of knowledge was the gradual and final acceptance of the theory of evolution. This theory became the basic concept — the eyeglasses through which advancing knowledge was based. The educators and leading minds were saying civilization had now advanced to the point where we could throw away the swaddling clothes of superstition and the crutch of belief in a Creator God. Evolution, advancing knowledge based on it and modern science became the new messiahs that were to deliver suffering humanity from its curses, baffling problems, evils and sufferings. But the discontent, evils and sufferings multiplied. Evolution failed utterly to solve human problems and woes. Modern science advanced until now, finally, it has produced the weapons of mass destruction that threaten to annihilate all human life — to become the Frankenstein monster that could destroy us all! In the autumn of 1926 I was challenged to examine the other concept of origins of matter — of the universe — and of life upon the earth — the existence of the Creator GOD! I entered into an intensive in-depth research of origins, of causes and effects. I disproved the evolutionary hypothesis. I found PROOF of the existence and reality of Almighty God the Creator. I proved conclusively, after intensive night-and-day study, that the Holy Bible is, indeed, the inspired Word of God — literally GOD SPEAKING, revealing spiritual knowledge, history and prophecy (history in advance). And I learned where I, myself, had been WRONG — wrong in what I had been brought up to assume, accept and believe — wrong in attitude — wrong in the way I lived. I learned the TRUTH about Jesus Christ — a truth few, strange as it may seem, really know! I not only accepted Christ — received Christ as Saviour — I GAVE myself and my life to him, to "brainwash" me — that is, wash my mind clean of false beliefs and false knowledge. To instruct me through his Word in TRUTH. He says, in the Bible, that HIS WORD (the Bible) is TRUTH. As he opened my mind to comprehend, he gave me UNDERSTANDING of WHY the world is as it is — of the PURPOSE God is working out here below, and what shall come in the future. Having been many years in the publishing field, I wanted to start a NEW kind of magazine — to make plain and clear and UNDERSTANDABLE this marvelous revelation of spiritual knowledge — of history and prophecy — of life and its MEANING — of world conditions and what God has planned for its future. Since the Bible is God speaking to mankind — since it is the TRUTH — and I wanted to make that truth PLAIN and understandable, I decided (and I'm sure God led me) to call the magazine The Plain Truth. But I had learned that God says, "Buy the truth, and sell it not … " (Prov. 23:23), and God's way of life is GIVING, rather than getting. I knew this magazine must not be sold, but given freely. And yet my magazine experience had shown me that unless people ASK for it — subscribe to it like other magazines — or pick it up by their own free will and decision on a newsstand, it would only be considered cheap and of no value. But I wanted to make this the MOST VALUABLE magazine of all — the most valuable and helpful to those who read it. I had learned Jesus spoke truth when he said, "It is more blessed to give than to receive." This world's way of life is "GET" — and God's way is "GIVE." I began to live the way of "GIVE" in my own life. And I found others saw the practicality of that way too. I started The Plain Truth February 1, 1934, with a circulation of about 350. I found that some of the readers wanted to follow the principle of "GIVE" and sent in unsolicited contributions to share with me in GIVING The Plain Truth. I had started broadcasting this same TRUTH, and I offered a free subscription to The Plain Truth. But I did not request contributions or financial support over the air. This operation has always been one of "GIVE" — not of "GET." The God whose TRUTH we give and share with millions has blessed this Work and it has grown remarkably. 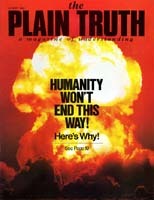 Today The Plain Truth is one of the leading mass-circulation magazines on earth — circulation now passing 4 1/2 million copies per month in six languages over all inhabited continents. It is supported by the tithes and freewill contributions of those who voluntarily, without solicitation or request, have become co-workers with us in this Work of "GIVE."